To set up your printer server for the shipment manager so that you can print labels, follow the below instructions. Once you install, the print server will start and your default browser should open to the welcome page. The Print Server will detect all available printers. 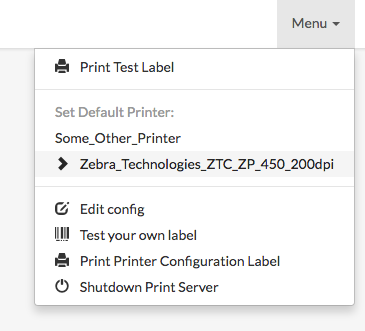 You can switch printers from the web interface by clicking the Menu Drop Down and selecting the thermal printer you wish to send labels to. Press Print Test Label to print a sample label. Please Note: The test label is in EPL format which should work for most printers but not all. The test print usually works but if it doesn’t, don’t worry. It may mean that your printer needs ZPL or another format which you can send via HTTP POST.